The recent one-year anniversary of the start of the Occupy Wall Street uprising has me preoccupied with occupy. Here’s what I’ve been mulling over. First, so we’re on the same page (even if, maybe, with differing opinions), I don’t think of Occupy as a broad based social movement. I know that’s not a popular idea with Occupy activists, but I just don’t, and as a matter of respect, I’m putting it out there. Instead, I think of Occupy as a cultural uprising rooted in a very specific and limited experience of economic injustice of a particular group. I know that where that group is concerned there are many exceptions, but I’m addressing the norm here, so hang in with me. This was first made evident to me by seeing Occupy activists in Hawai’i, a place in the midst of a major struggle over the U.S. occupation of the Hawaiian nation. What I saw was an almost entirely white group on the island of Hawai’i holding signs saying “Occupy Hawai’i.” That, I think, is a bright red flag indicating that particular Occupy faction’s cultural isolation. Regardless, I was then and am still, a fan. Occupy opened up space on the left of the political spectrum for a discussion of economic injustice that had for too long been marginalized. Good for them. Good for us. All around, a very good deal. As an uprising, that is. It’s as an aspiring movement that I find them problematic. That’s what’s been eating at me lately. I believe that a truly transformative movement must originate from the imaginations and needs of those on the bottom of the global economy. When people on the bottom stand up, all of us are lifted. And, at the bottom of the global economy, people of color are disproportionately represented, just as we were disproportionately unrepresented in the Occupy uprising. Occupy is, at its core, an uprising of marginally middle class, downwardly mobile white people, many of whose hopes for upward mobility were riding atop the bubble that burst as the economy crashed in 2008. The rage they express, though righteous, is, I believe, as much about feeling cheated out of a status to which they feel entitled as it is about anger over the arrogance of elites. And that sense of entitlement is something most people of color know nothing of. African Americans, Latinos, and Native Americans, were already suffering in a decades long recession before the crash affected white folks. And government inaction, horrible exploitation, and the arrogance of elites is nothing new to us. It is, in fact, the normative experience for most people of color. For instance, the African American unemployment rate actually went down to 8% from a pretty steady rate of 8.4% in 2007. Before that, it held steady at about double the unemployment rate of whites for 4 years. The unemployment rate among Native Americans was 7.7 percent in the first half of 2007. By 2010, it rose to 15.2%. Latinos have also historically suffered a higher rate of unemployment than whites. Even Asians, the so-called model minority, are suffering more from long-term unemployment since the crash than white people. And when it comes to the mortgage crisis Black and Latino households were especially hard hit, and many long before middle class families were impacted. It ain’t right but it makes sense when you consider that the subprime mortgage market was created in order to exploit the lack of mortgage opportunities for African Americans resulting from red-lining, racial exclusion from prime real estate markets, and, for many, bad credit incurred in what has always been a bad economy for Blacks. 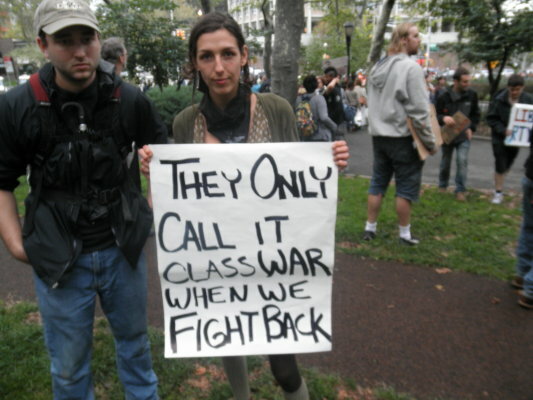 Where was Occupy then? And what does their silence pre-crash indicate about how the core of the uprising defines their collective self-interest? All of this nothing to do with the morality or earnest good intentions of occupiers as individuals, but much to do with how white privilege distorts the ability of white folks to define their self-interest in broad terms. In this instance, that self-interest is far too bound by the color line. You know, that line marking self-interest that runs behind whites people’s heels and in front of other folks toes? I know they don’t have eyes behind their heads, but they could just turn around, that is, if they’re not too distracted by the prizes or problems they see in front of them; prizes and problem made all the more distracting in times of economic hardship. I’m not suggesting we shun Occupy or deny them our support as one in a broad range of tactics employed by the movement we will, I hope, create with them. People of color and the very poor are no more moral or just than Occupy. We’re just positioned such that when we move, fewer people are left behind. And, because of how we’re positioned within the structural inequities of the U.S. and the world, the solutions we create have the most far reaching and positive stimulative effect, both on our economy and on our political culture. It’s time for people of color, especially those of us advocating for the poorest among us, to start telling our stories and leading uprisings around our needs. We can’t expect Occupy to do it for us. If we don’t, our radical politics will be hemmed in by white rage on the right, and white rage on the left, and the spectacle being created on both sides will contribute further to our invisibility.